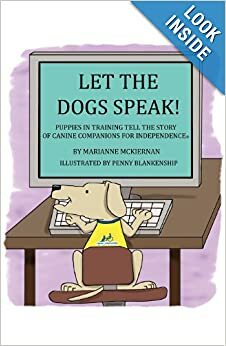 Content from Rambam's Ladder blog post is included in Let the Dogs Speak (Marianne McKiernan, pub. Jan 4 2013). Having my very own chapter in a published book is pretty freaky awesome, but seeing Micron's blurb on the back cover is really what I've been claiming bragging rights for. The subject of fake service dogs gets me pretty wound up. That anyone with a credit card can buy a service dog vest for their pet dog is, well, outrageous. NPR Commentator Beth Finke invited me to share my thoughts on her blog. I blushed at the honor and did my best to raise awareness of this nonsense. And now a word from a puppy raiser. An interview posted at TheDenverChannel.com about raising Euka II, our fourth CCI puppy. I was asked to share a bit of profundity on this volunteer puppy raising stuff. Instead I kinda just prattled on until Pet Blogs United said enuf already! So anyway, I'm jazzed to have been asked, let along actually hitting the blogosphere. Many thanks to Pet Blogs United for helping us to raise awareness of Canine Companions for Independence. i like your own composing, it's therefore understandable, enjoyable as well as readable.. thx.